I wanted to follow up on two posts I made some time ago regarding our tires. The posts I am referring to can be found here: Previous Post Update & Tires & More!!! Hopefully this info may save some money for those of you who are doing similar projects. We did the following not long after getting our new tires but I never made a blog post about it so here it is. Originally I wanted to purchased some used tires at half the price of new. After purchasing them and having them installed we noticed that the bus vibrated really bad. They informed me that they were unable to balance the kind of wheels that are on the bus To make a long story short we went back and had new tires installed all the way around hoping it would fix the problem but found that the vibrating had not stopped. I then did some research and found that I needed to have my tires not only balanced but trued. I located a place that could true my tires. Truing is the process of shaving the tire in different places to get it perfectly round and balanced. They do this with the tires still on the bus so not only do you get balanced tires and wheels but everything that spins and is connected to the wheels is also balanced. Had I know about this process before, I could have just kept the used tires and had those tires trued and balanced instead of spending the extra cash on new tires. Now the bus rides very smooth with no vibration at all! oof..Those cast center wheels with "widowmaker" (split) rims are heavy and add a lot to unsprung weight and are really industrial, Do you have leaf springs underneath or Air bags? It is equipt with leaf springs. How much did it cost to true the tires? 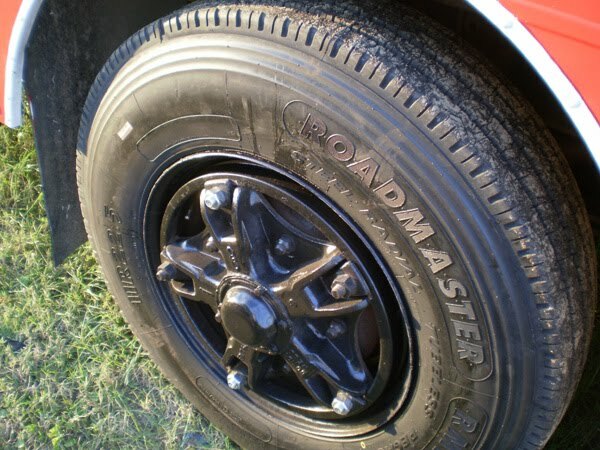 I am an owner operator truck driver and of course dont have those types of rims, but have never heard of trueing tires. It sounds really interesting. Your project is beautiful. You did a wonderful job. We plan on purchasing a school bus over the next few months and make it a slow transformation project. No rush especially with me on the road so much. Thanks for the comment. If my memory serves me right I think the truing cost around $500 for 6 tires. The good thing about the truing is if I had known about it before I purchased the new tires we could have saved hundreds by just keeping the pre-owned tires because either way I had to have the truing done.